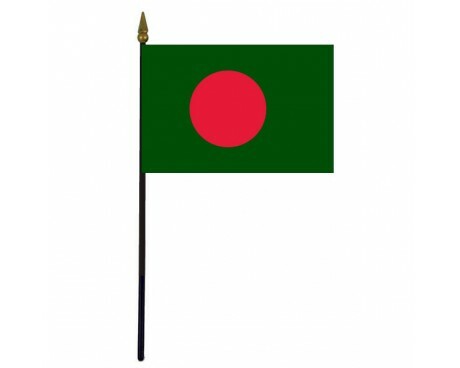 Bangladesh Stick Flag - 4x6"
The modern flag of Bangladesh is one of the youngest flags in use. Like many national flags, it originated as a revolutionary banner during the nation's war for independence, and has been used as the Bangladesh flag ever since that war concluded. The national flag of Bangladesh was adopted officially on 17 January 1972. It is based on a similar flag used during the Bangladesh Liberation War of 1971. The map was later deleted from the flag by the order of General Abul Manzur, most likely to simplify the design. A red disc is on top of the green field, offset slightly toward the hoist so that it appears centred when the flag is flying. The red disc represents the sun rising over Bengal, and also the blood of those who died for the independence of Bangladesh. The green field stands for the lushness of the land of Bangladesh. 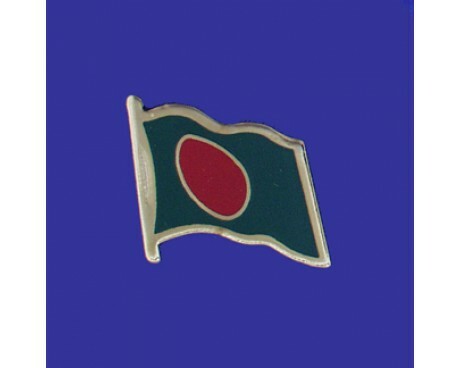 Bangladesh flags have a dark green field with a red disc that is slightly offset from the center. The disc represents the sun rising over the country, and its red color is intended to represent the blood that the people of Bangladesh shed during their war of independence. The green field represents the land's natural bounty. The original design of flag of Bangladesh dates back to the Bangladesh Liberation War, when the nation fought against Pakistan to gain its independence. 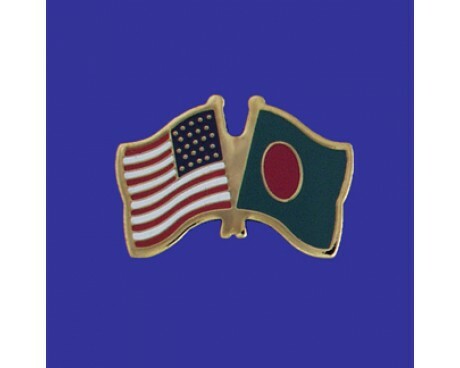 The first design was used while the war was being fought in 1971, and it was slightly different from the current design of the Bangladesh flag. Old Bangladesh flags shared the green field and red disc of the current flag, but they also included a yellow outline of the country's borders in the disc's center. The first physical copy of the flag was created by political activists and students at a Bangladeshi university in 1970. They chose the design in part to emphasize their desire to separate the country from Pakistan, and they did so by replacing the star and crescent that represented Pakistan with entirely new symbols. The first flag was made out of clothing that had been donated by a tailor who sympathized with the political activists. The original design turned out to be impractical for regular use for the nation. The government of Bangladesh removed the country's outline from the center of the flag in 1972 because it was prohibitively difficult to create flags that accurately depicted the nation's shape on both sides of the flag. Bangladesh has not altered the design since it implemented that first change. The flag of Bangladesh earned a place in the Guinness Book of World Records in 2013. Thousands of people came together to create a human version of the flag, which was the largest human flag ever created.